I only use HWiNFO for fan control because my laptop suffers from overheating. It is the main goal. I'd like to thank you for this because without HWiNFO it is not possible to do. But since I use HWiNFO my laptop plugged in occasionally auto alternates between battery and plugged mode. I can't understand why but I'm using another software for battery monitoring called BatteryCare and maybe it is a conflict between BatteryCare and HWiNFO. 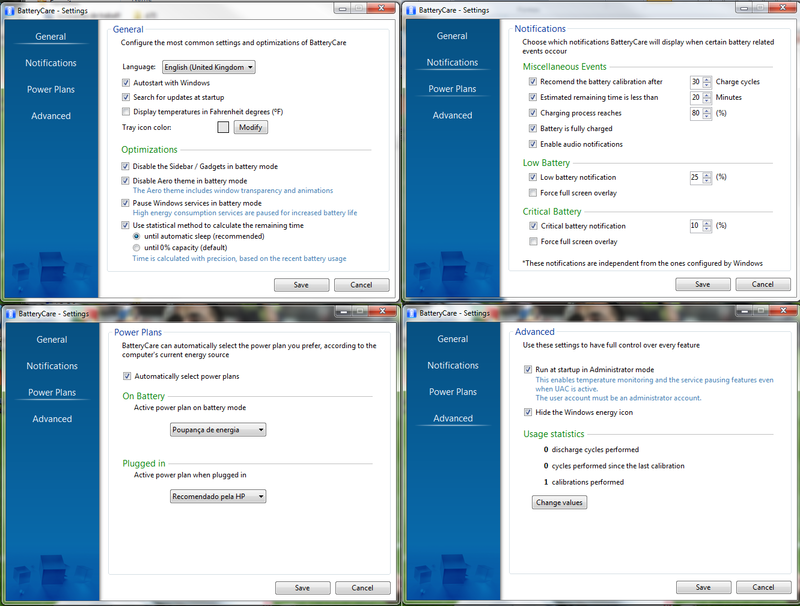 I took some print screens of BatteryCare settings, maybe will help. Before I had another conflict with HWiNFO and dual monitor. I solved this with uncheck "GPU I2C via NVAPI" and check "GPU I2C via ADL" and it worked. Is this the solution or do you suggest to try another solution? This could indeed be a conflict between HWiNFO reading or setting of fan speed and commands to read battery status. You might try to pull the battery out and see if the problem goes away. So, you're telling me that it is a conflict that only occurs when we are using speed fan controls and reading battery informations at the same time. The conflict is between HWiNFO and the interface responsible for it and not between HWiNFO and BatteryCare, right? And there is not a way to turn around this situation? As I only use HWiNFO to control speed fans, disable some kind of settings won't help? I'll try to remove the battery and see if the problem goes away like happened in the other thread you showed me. And about the conflict between HWiNFO and dual monitor? Anything to say about that? Yes, it's a conflict between HWiNFO (when reading current fan speed or sending fan commands to set speed) and any other applications that read battery information (that might include the Windows battery monitor). You might try to disable the "HP ENVY 17/DV6/DV7 EC" sensor in HWiNFO to see if that helps. It should reduce the probability of a conflict by reducing the commands send by HWiNFO. I'd need a debug file from the problem with dual monitor to analyze it. But as long as you found a solution, I'd say it's OK. The problem goes away after removing the battery. Then I disabled "HP ENVY 17/DV6/DV7 EC" sensor and I put the battery again and since then I don't have any problems like before. So it seems to help. But I think I have new ones. Fan stopped working twice and when that happened my Internet connection was disabled and only returns with reboot. I disabled all "HP ENVY 17/DV6/DV7 EC" sensor (Mainboard, GPU, CPU, PCH, CPU (fan speed)). Should I disable all of them or just a few ones? "HP ENVY 17/DV6/DV7 EC" sensor is responsible for what? Best is to disable all values under that sensor, but I'm not sure if that will 100% help. That "HP ENVY 17/DV6/DV7 EC" sensor reads several values from the Embedded Controller which is responsible for fan control too (so it's using the same interface as when sending commands to change fan speed). The fan problem (stopped working) which I reported before happened with all values disabled. But I'm still testing with all values disabled. For example, all day yesterday HWiNFO stopped working once and the fan problem never occurred. I think the only 100% workaround is to unplug the battery. I have been trying several different options and the problems disappeared during the last week. I kept the "HP ENVY 17/DV6/DV7 EC" sensor disabled and I disabled the "Battery" sensor too. So far everything has worked well, even with the battery in.